Each year, at the American Fisheries Society Annual Meeting, past Fenske Fellows come together with the Fenske Committee for a get-together, whether it is a breakfast or luncheon. This is a great way for the Fenske Fellows to get to know each other and learn about each other’s research and past Fenske projects. At the 144th American Fisheries Society Meeting in Québec, Canada, I organized a get-together with a group of past Fenske Fellows. 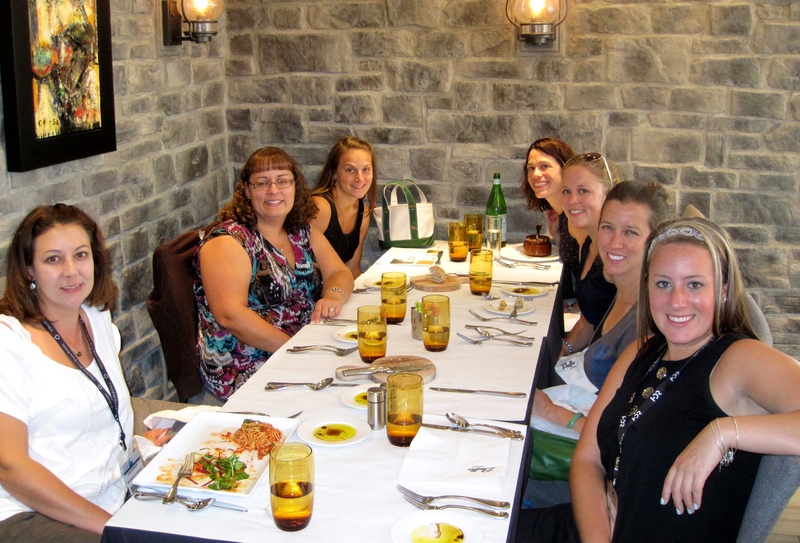 We ate lunch at Bello Ristorante, a delicious Italian restaurant. Fenske Fellowship Committee Members, Dr. Dana Infante (MSU) and Jess Mistak (Michigan Department of Natural Resources), and past (and present) Fenske Fellows including Hanna Kruckman (Eastern Illinois University), Dr. Abigail Lynch (United States Geological Survey), Dr. Amy Schueller (National Oceanic and Atmospheric Administration), Marissa Hammond (Michigan State University) and me dined together. (From L to R) Dr. Dana Infante, Dr. Amy Schueller, Marissa Hammond, Jess Mistak, Hanna Kruckman, Dr. Abigail Lynch, and Molly Good. LESSON #5: Do not believe that GoogleMaps is always right.